Our SimpleMed+ Medication Dispensing System is an advanced mobile weekly medication dispenser designed to work with our Medbox™ Weekly Card. By simply inserting a Medbox™ Weekly Card into the SimpleMed+ device the caregiver can provide their patient, or loved one, with a remotely monitored medication dispensing system. 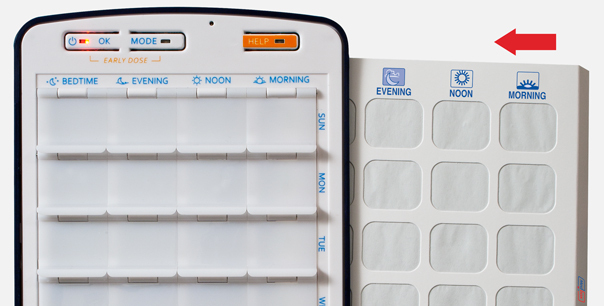 When it’s time to take medications the pre-programmed SimpleMed+ will illuminate the specific compartment containing the scheduled medication dose. If the patient forgets to open the SimpleMed+ compartment the device will chime, at timed intervals, as a friendly reminder. If the patient misses a dose the SimpleMed+ may be programmed to alert a caregiver by way of a text or email message. Mail-Meds Clinical Pharmacy can also provide complete medication management services that include: medication packaging and delivery; remote medication adherence monitoring; direct patient communication to review/discuss missed doses; and medication adherence reports and alerts for family members or caregivers. The SimpleMed+ Medication Dispensing System transfers the “medication management” responsibilities to the pharmacy thereby eliminating the time spent on filling pill boxes and trips to the pharmacy. Most importantly, the SimpleMed+ Medication Dispensing System will eliminate the constant worry associated with managing someone else’s medications. Give yourself the reassurance and peace of mind that your patient or loved one is taking the right dose of medication, in the right amount at the right time. Order the SimpleMed+ Medication Dispensing System today from Mail-Meds Clinical Pharmacy. Your simple solution. Posted in SimpleMed+ on December 30, 2014 by admin.